5x7 printable digital nautical baby shower invitation. I will customize your invitation using the information you send me as outlined further down in the CUSTOMIZATION INSTRUCTIONS section. You will receive one file. This is a digital invitation only. No physical product will be shipped to you. File dimensions: 300dpi; JPEG format; 5x7 inches with a .125in bleed area on all sides to ensure that your file will print all the way to the edge of the paper. 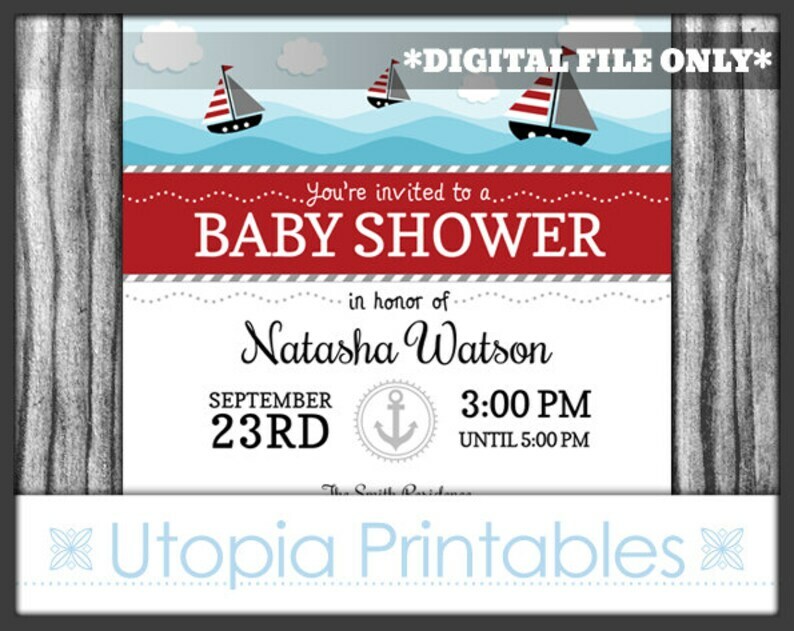 If you would prefer an 8.5x11" file with two invitations on one page, this can be done upon request. Your invitation will not be customized until after payment has been received. Please follow the instructions below to begin the customization process. 2. After you complete your purchase, I will send a proof to you via Etsy Conversation within 24-48 hours of receiving your information (usually faster). Please inspect the proof carefully. If you need to make corrections, changes will be made within 24 hours. 3. Once you approve the proof, I will finalize your invitation and send it to the email address on your receipt within 24-48 hours. You are responsible for making sure this email address is correct. Any changes requested after the invitation has been finalized will incur an additional fee. *If you'd like changes to the actual invitation design (colors, size, wording of the headings, etc. ), please contact me BEFORE buying to see if your desired changes can be accommodated. There may be additional charges for these modifications. This file is for your personal, non-commercial use only. It may not be resold or shared. You may print as many copies of this file as needed either at home or with the professional printing service of your choice. All items in this shop are digital files. No physical product will be mailed to you. Turnaround Time: Unless otherwise stated, proofs are delivered within 24-48 hours after I receive your full payment and your customization details. Once you approve the proof, the final download will be delivered within 24-48 hours.